The EURJPY has backed off a ceiling at 126.78. That ceiling was started back on March 20. On Friday the high reached 126.76. The high on Monday reached 126.784. The last three highs all within 2 pips of each other. Sellers leaned against the area and the price fell today. The low for the day reached to 126.19. That low was near other swing levels, it got close to the underside of a broken trend line as well. Since that low, the trend line has moved higher and is now joined by the rising 100 hour MA (blue line) at 126.125. That area - from 126.125 to 126.21 - is now eyed as support. We currently trade at 126.389. Can the sellers keep the pressure on the pair and get below that support target. Doing so is what the shorts (from above or even right here) would love to see. IT would solidify the ceiling and have traders looking toward the 100 day MA (overlayed blue line at 125.817) and the rising 200 hour MA at 125.708 (currently). The 200 day MA is not far away as well at 125.61. Is there a closer risk level ahead of the triple highs? Looking at the 5-minute chart, the price action today has not really been trendy. The price bounced off a low at 126.192 up to 126.63 which was just short of an earlier high at 126.639. 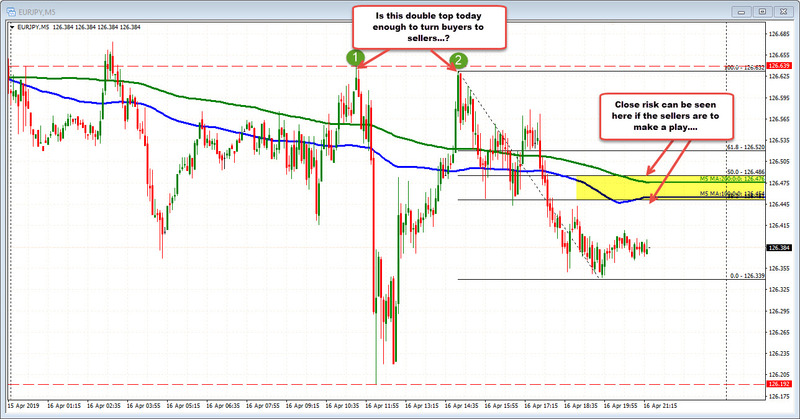 That intraday double top may be the clue for buyers to turn more to sellers and bring the price back down. If the bias is to stay negative, in between, is the 100 and 200 bar MAs (blue and green lines in the chart below) at 126.454 and 126.476. Stay below those levels, and sellers remain more in control. Move above and the trading waters are still muddy with the buyers/bulls having a little more of an edge. Watch 126.45-49 for sellers.